What do Ross Growcott, Bob Beattie and Ernie Hug have in common? Three fringe defenders who each played barely fifty games in their half decade VFL careers. Neither with any sort of claims to fame notwithstanding the latter’s state selection in his final season. If you guessed that they were included in the Scanlen’s Footy Card set of 1966 you are correct – but they were also “pop ups”. Of course, collectable footy cards had been around for decades prior. These sort of cards were often used as a sales gimmick to enhance sales of a particular product. Initially cigarettes we believe, but by the early ‘60s, this strategy had swollen to include products such as petrol, breakfast cereal and soft drinks. Fifty years later, most of us have forgotten that Scanlen’s was actually a brand of chewing gum. Buy the gum, get a card. But by far, the most enticing and game changing feature of this particular collection was the “pop up” card. To a ten year old, this was an engineering phenomenon not encountered before. A die cut card, which when folded backwards retained the player’s pose yet provided a tripod like support so the card could stand up all by itself. Wow! Presumably reserved for the true icons and household names of the era, the 12 “pop up” cards checklist began with prominent champions such as Barassi, Whitten and Skilton. It concluded eclectically with the slightly less conspicuous superstars Growcott, Beattie and Hug. Go figure? This set – the 1966 Scanlen’s – was different. Very different. Quintessential is not a word used often. Firstly, the series consisted of 72 released cards – this was almost twice the number in previous sets. Every player was photographed clearly in a close up – a precise portrait pose. 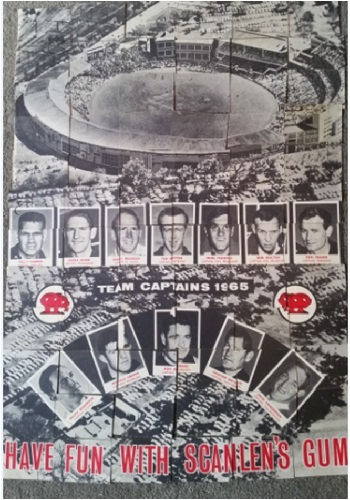 The set also included 12 interstate players (from the WAFL) and uniquely, the reverse side of each card was a portion of a larger 72 piece jigsaw – a majestic, black and white, aerial photograph of the MCG on Grand Final day. And, of course, the “pop up” card was a feature. Some readers will readily identify with one of the portraits in the set. The often lampooned photograph of a younger and biologically original Sam Newman is from this 1966 Scanlen’s Footy Card series. The one in which Sam appears to have an apparently oversized head. Ironically, this card was not a part of the original marketed set. It was only revealed some years later, that this photograph was one of an additional ten portraits which were kept as “back ups” by the producers. Not sure how strategic the entire project was in those days either. The photographs were probably taken in 1965 and stockpiled in readiness for the new season. Blue skies in the background for the Geelong players are contrasted against the fading light available by the time he got to the Western Oval. The Essendon players are all photographed at the MCG and each of the Blue Boys are captured holding the same ramshackle white painted Sherrin – presumably in use that evening as the club prepares for the upcoming night series. That may also explain why Maurie Sankey card was “held back”. An original inclusion, Sankey sadly lost his life in a motor accident a few months before the 1966 season started. It has never been revealed which player’s card was “elevated” into the series as a result of the Sankey tragedy. The set included Jim Forsythe and Ron Fry but missed Ian Stewart and Des Tuddenham. Interest in the ten “back up” portraits and the stories that accompany is profound. Newman’s card remained a “back up”. So too did John Northey. Barry Davis had just completed a remarkable double – a VFL and a District Cricket premiership in the same year but that was not enough to earn his card a “promotion”. Ken Emselle missed the cut. He confessed years later that he felt was included only because he wore his club jumper to training that night and the photographer was getting desperate. Terry Waters recalls his photograph being taken in near darkness on a median strip on the Princes Highway. His season over, Waters agrees to meet for the shoot after work but only if the photographer can get to Dandenong. A close look at the photograph and you can see jeans and overalls under the Collingwood jumper. Not surprisingly, Water’s card was also “held back”. The ’66 Scanlen’s series was superb for many reasons. But essentially for me, it permitted perhaps otherwise easily forgotten names like Tom Allison, Ian McCrae and Graham Ion to be appropriately included in conversations that involve names such as Nicholls, Ditterich and Baldock. But if nothing else, as final blessing, the 1966 Scanlen’s Footy Card series provided an otherwise very deserving battler – Merv Hobbs – with the opportunity for his scrapbook to include a second photo. Ah, the oldy-worldy nostalgia of black-and-white footie cards! Brings back memories … I also remember the equivalent Scanlen’s series of player cards for the Sydney Rugby League. By ’67 though these cards were in colour (somewhat faded now … the sprinkling of which I have retained by chance). Ernie Hug. He was famous for owning a Rolls Royce. Sadly killed in a tree felling episode. Bob Beattie i’ve not heard of, Ross Growcott i’ve seen the name in books, but never saw him play. Tom Allison, father of Brett who like his father also played for North Melbourne, though he finished his career in Sydney. Fantastic piece Warwick. A full 1966 Scanlens set would be worth quite a bit I’d imagine…. Eight players in the ’66 card series were to have sons who played at the highest level. Actually one, has a grandson playing tonight! Seen another set offered on eBay for $2,750. The nostalgia is not in owning the set – it is in owning the memories. Russell Blew was my last collected card. My best friend had it but wouldn’t surrender it – even once the season was over. His mum brokered a deal whereby I gave him all of my doubles (about 25 cards) for one Russell Blew card. A bit like the John Pitura deal ? Well Warwick, is it pushing my luck to ask who the eight are? The one with the grand son, may his name be Papley? Ted Whitten, Mal Brown, Graeme John, Ken Fraser, John Dugdale, Frank Dimmatina, Tom Allison and David Darcy.